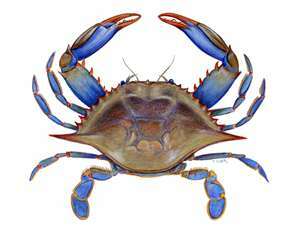 Most people complain about blue crabs because they aren't easy to deal with. Cleaning them, cooking and then picking them is indeed a task. But, the reward of fresh, creamy, milky crabmeat is well worth it. My mom (a Floridian) actually ices them down, which puts them to sleep. Then, she cleans them while they're still alive. I know, I know, this sounds horrific. But those of us biology geeks know that crabs really only operate off a "nerve net" not an actual brain, so there is no suffering involved here. This way, we cook the cleaned crabs and there's none of that spongy, foamy crap inside the body to clean out. That's just grosser than gross. My sister and I are probably the only people you'll meet who will say that we actually enjoy picking crab. We learned as kids and as we moved into adulthood, it became a peaceful end-of-the-beach day ritual for us. Get showered up, pour a glass of white wine and sit out on the balcony picking crab in the breeze. BUT...there's always a but, right? No one likes dealing with the claws. They are a pain in the rump, frankly. But, it's so hard for us to deal with wasting anything, so we freeze them assuming we'll deal with them one day. Well, my parents have had crab claws in their freezer for a few months now and it's been driving my dad crazy. He keeps planning the day to put them in the trash (the night before pick up because crab in a can on a hot day=horror movie) and then that day comes and goes and he realizes (dammit!) that he forgot to put them out there. Then, I was faithfully watching the Food Network not long ago when one of Maryland's big time crab cakes places mentioned that they use the claw meat in the crab cakes and save the lump meat for more sophisticated dishes. AH HA! I had the answer! Fast forward to today. I took the claws off dad's hands. I picked one gallon sized Ziploc of claws, which gave me about 1/2 pound of meat. I'd never used the claw meat in a cake, so I was really curious to see how it turned out. I did a basic cake...tore 2 slices of bread (crust removed) into small pieces, moistened with milk, then mixed with fresh parsley, some mayo, worchestershire, Old Bay, salt, baking powder and an egg. I refrigerated the mixture to firm it a bit then shaped into cakes and pan-fried. That little 1/2 pound of crab yielded 6 AWESOME crab cakes for our dinner tonight. My sweet little adventurous eater! when I told her we were having crab cakes for dinner, her reaction was "really? I love it, love it, love it, love it!" Imagine her reaction when I told her I'd also made homemade peach ice cream for dessert? It was rockin' good. I'll probably post the recipe for that tomorrow so you can try to squeeze in some last of summer peachy goodness at your house!